When it comes to luxurious tropical resorts, overwater bungalows instantly come to mind. While many require an international flight followed by a seaplane hopper to a private island in a far-flung locale like French Polynesia, don’t think these resorts are strictly reserved for honeymooners with a bottomless budget. If you’ve racked up plenty of points, your hard work — and spending — will soon be rewarded. While these bungalows may require more points than your average hotel room, the price is well worth it for the views and bragging rights alone. Here’s a look at five incredible overwater bungalows you can score with points on your next (private) island-inspired getaway. Perched over a lagoon, the 149-room Le Méridien Tahiti is home to traditional-style thatched-roof bungalows that are about as dreamy as you can get. Encased in woven palm walls with timber floors, terraces and a Polynesian-inspired bathroom peering out over the reef, these 600-square-foot pieces of paradise not only look the part, they also have everything you need for a relaxing seaside stay, from private terraces perfectly set up for breakfast or cocktail hour, as well as lagoon access off the end of the pontoon. And if you think you may tire of these tropical views — if that’s even possible! — the resort offers plenty of activities that’ll keep you distracted, from private chef-driven cooking classes at signature spot Le Carré, where you’ll learn how to whip up crispy shrimp with mint and mango salsa, to tours of the nearby Hitia’a lava tubes. Bungalows at the SPG Category 5 hotel start at $429 or 12,000 Starpoints per night. Sleep under thatched roofs in Le Méridien Tahiti’s traditional-style overwater bungalows. Image courtesy of the hotel’s Facebook page. The quickest way to reach this private island resort in the Maldives is by seaplane from Velana International Airport (MLE). The 22-acre island in the Dhaalu Atoll is one of 1,192 in the Republic of Maldives, and this one just so happens to have a private reef house that’s one of the nation’s most famous. With only 77 rooms in total, The St. Regis Maldives Vommuli Resort really captures that private island feel. Tack on overwater options and you’ve got a match made in honeymoon heaven. 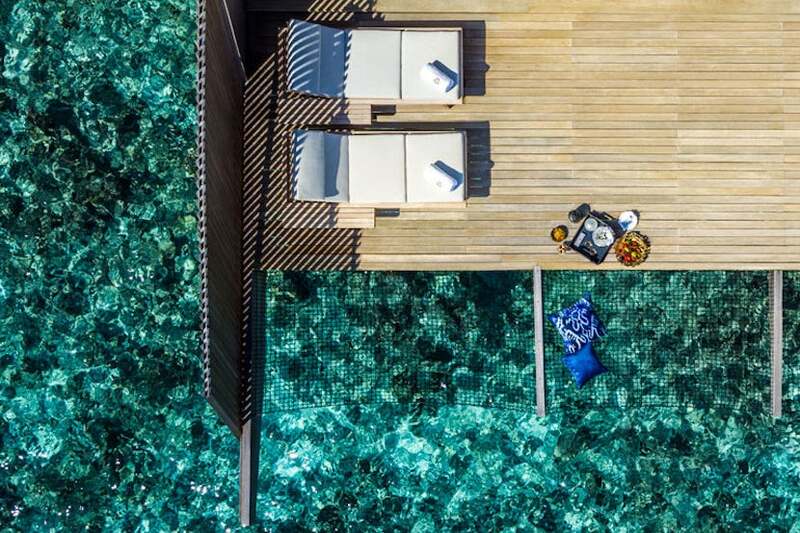 Here, you’ve got a few overwater rooms to choose from, such as the 1,959-square-foot overwater villas with floor-to-ceiling views of the Indian Ocean — plus private plunge pools and overwater hammocks — as well as the eight overwater St. Regis Suites. These 3,036-square-foot suites show off stunning ocean views from every room and come complete with daybeds sitting under wooden gazebos, in addition to St. Regis’s signature butler service. Bungalows at the SPG Category 7 hotel start at $2,216 or 32,500 Starpoints per night. The resort is also offering opening promotions with specials like double Starpoints and complimentary daily breakfast. Lap in luxury with butler service straight to your overwater suite at The St. Regis Maldives Vommuli Resort. Image courtesy of the hotel. 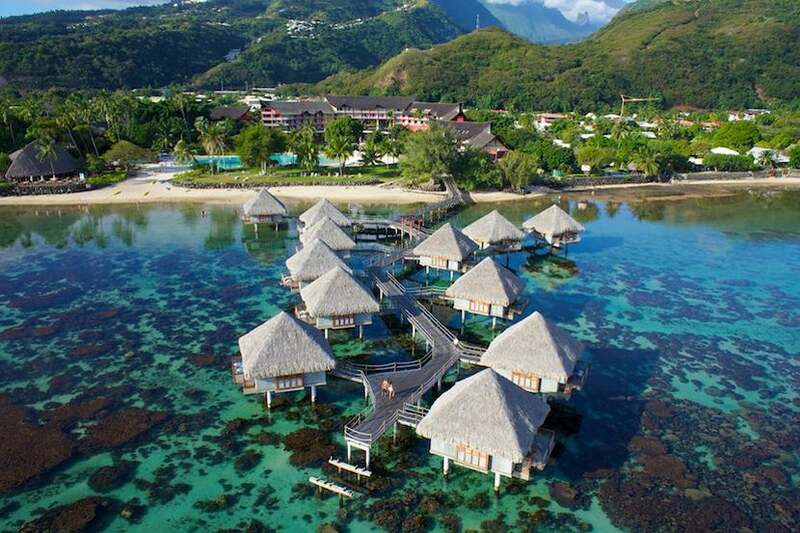 Set along a cove on the northwest side of the island of Moorea, the four-star InterContinental Moorea Resort & Spa is about as picturesque as it gets, with a backdrop of volcanic peaks, views of the South Pacific and lush gardens home to more than 200 types of tropical plants. While the junior suite garden and beach bungalows are stunning enough, the 49 junior suite overwater bungalows take it to whole other level. Hovering above the lagoon, these bungalows boast their very own covered gazebos with sundecks and beds perfect for tanning. Of course you can also hop off and take a dip directly in the lagoon or opt for Hélène Spa’s soothing sunset-facing river bath instead. Rooms at the Category 7 property start at $518 or 40,000 IHG Rewards points per night. 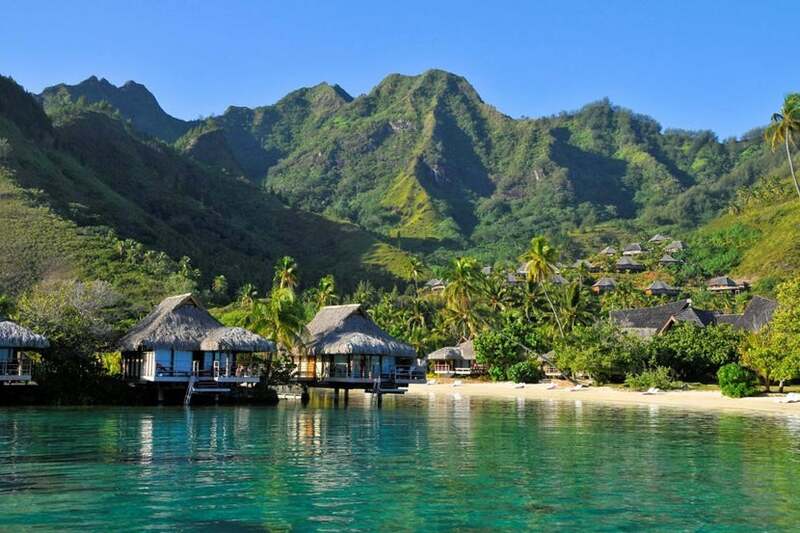 Soak up views of volcanic peaks at the InterContinental Moorea Resort & Spa. Image courtesy of the hotel’s Facebook page. From Velana International Airport (MLE), where you’ll have exclusive access to the Conrad Lounge, you’re just a 30-minute seaplane ride from Conrad Maldives Rangali Island in the South Ari Atoll. Rooms here span two islands: Rangalifinolhu, dotted with beach villas, and the smaller island of Rangali, where you’ll find the overwater villas. One of our favorites is the deluxe water villa, with its terrace leading down to the ocean, plunge pool and four poster “floating” bed showing off ocean views from every angle. If you’re after a spa escape, you can also book a water villa in the resort’s Spa Retreat area, which features a spa room with a menu of tropical-inspired treatments. 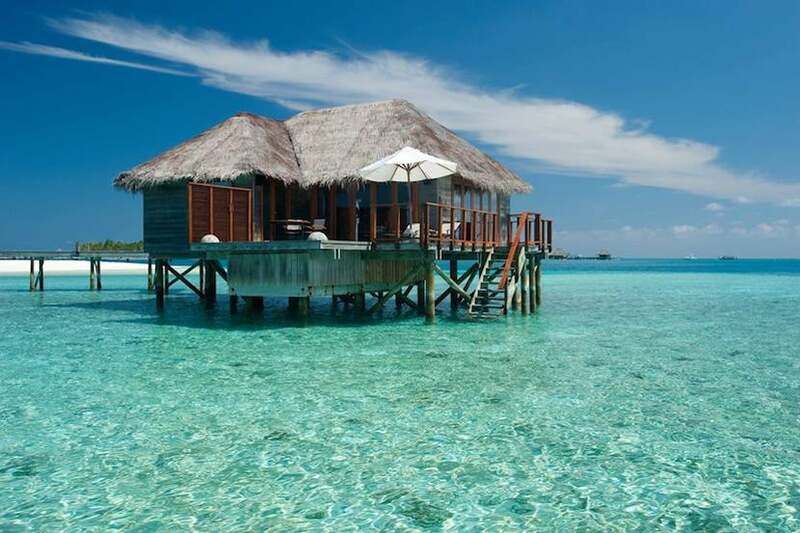 Water villas start at $1,150 or 322,000 Hilton HHonors points per night. Sleep in beds facing the sunset at Conrad Maldives Rangali Island. Image courtesy of the hotel’s Facebook page. When this former Hilton hotel opens its doors in April, it’ll be the first new resort to debut in Bora Bora in a decade. Expect a revamped version of the resort with 28 garden and beach villas, plus 86 overwater bungalows showing off horizon and lagoon views in addition to featuring private pools and al fresco hammock-style catamaran nets. As if this isn’t glamorous enough, you can go all out and book the best of them all — the two-story Presidential overwater villa, complete with an outdoor living area with a bar and day beds, direct lagoon access and a special spot for in-suite massages. The Category 9 Hilton property starts at $720 or 80,000 Hilton HHonors points per night. Cozy up in the private cove on Motu To’opua at the new Conrad Bora Bora Nui Resort & Spa, set to open in April. Image courtesy of the hotel. Have you stayed at any of these? Tell us about your experience, below. 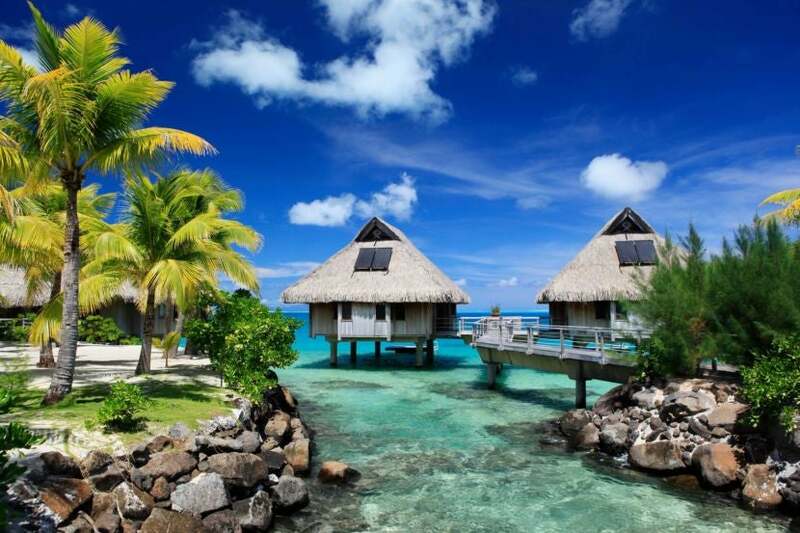 Featured image courtesy of the Conrad Bora Bora Nui Resort & Spa.